This topic contains 9 replies, has 2 voices, and was last updated by Alexander Bautz 1 year, 7 months ago. 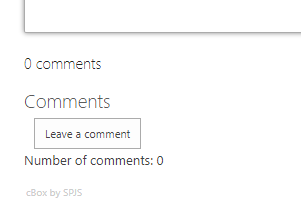 When a user subscribes to new comments, it creates a record in the list with ‘ID=99:subscription’ at the end but which counts towards the comments. So when 2 users subscribe, the posts says there are now two comments despite there being none. Is there a way of not including them in the count? Thanks Alexander – I do have the latest version but it still doesn’t seem to be working. Do I need to refresh or reindex? Or does it only work for new ones, not the old ones? Sorry, but I don’t understand. Does subscriptions still show in the count? Maybe your browser have the old version of the script cashed? – hover over the “cBox by SPJS” to see the version number. Or perhaps it’s because of this script you’ve given me? Unfortunately that still shows incorrectly. I’ve tried using private mode but still the same result. Anything else I can try? Apologies, that did work! I just renamed the file and reuploaded the new one with the same name but SP automatically re-linked all CEWP to the old file so hence didn’t reflect! No problem, I’m glad you got it working.